“Now He’s At The Zoo”. Circa late-1940s. An original vintage London Underground poster for travel to the London Zoo. In the 1920’s, the Underground was regularly producing posters (between 40-50 a year) to inform passengers of the wonderful places you can visit via the tube, and how far you can travel. By the 1950’s, the company was doing little marketing via this medium (no more than 10 posters a year were created). Thankfully, the eighties brought back a resurrection of Underground poster art. 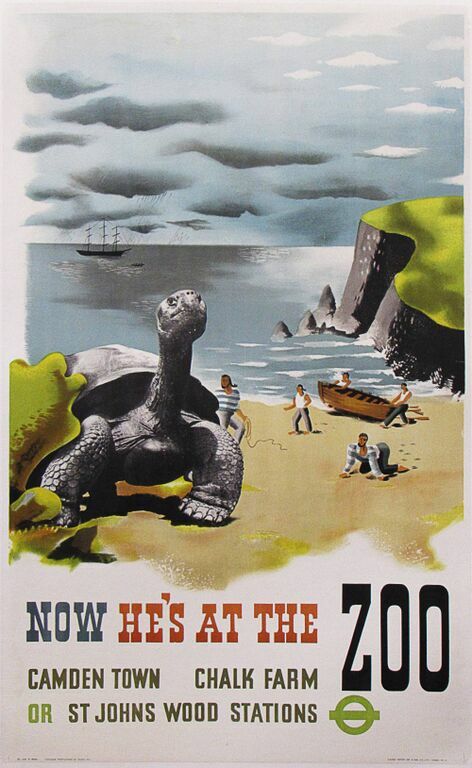 This particular poster is advertising the ZSL London Zoo, the world’s oldest scientific zoo. Linen-backed.